Hearthstone is adding new Legendary weapons with the upcoming Kobolds & Catacombs expansion. This is a major addition to the game, so Shacknews is breaking these down individually, continuing with the Mage. As part of its upcoming Kobolds & Catacombs expansion, Hearthstone is adding an interesting new mechanic that takes weaponry to a (literal) new level. Legendary weapons are now a part of the game, giving each of the game's nine classes a Legendary weapon to wield. Each of these weapons has the potential to impact the game in various ways and Shacknews is going to break each of these arms down one-by-one. Today, we take a look at the Mage, another class that doesn't usually pack weaponry, unless it's from Medivh, the Guardian. But this weapon isn't about offense. It's about fitting right in with the Mage's existing deck types. At the end of your turn, draw 3 cards. This almost certain to become a Mage staple. It's a slightly stronger version of Arcane Intellect, but because it's played during the game's later turns, it's most likely going to refresh the Mage's waning hand. Mages are at their most dangerous when they have resources and are usually beaten only when their hands start to fizzle. With Aluneth providing fresh cards at the end of every turn, a good Mage player will be able to parlay those fresh cards into a victory. And Mages will have plenty of options to ride to that victory. Aluneth is a no-brainer for Quest Mages. The key to Quest Mage is completing the quest quickly and getting all the Exodia pieces together for the two-turn kill. Aluneth's continuous card draw mechanic ensures Mages will quickly bolt through their Primordial Glyph, Cabalist's Tome, and other tools, while also pulling their Archmage Antonidas, Sorcerer's Apprentices, and Molten Reflection spells together. It also means Mages won't need to keep two copies of Arcane Intellect in their deck, which will free up a precious spot for a different card. 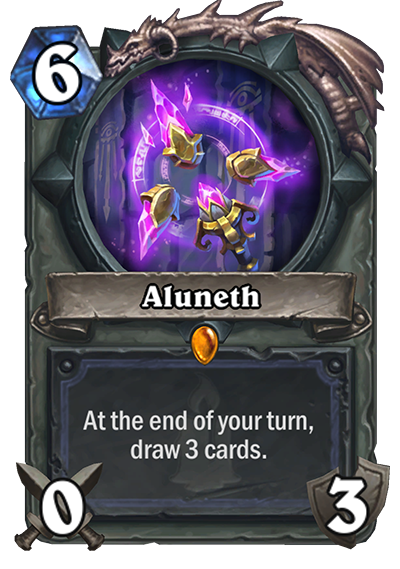 Freeze Mage will similarly be boosted by Aluneth's card draw. Mage players can simply keep drawing their Frost Nova, Doomsayer, and Blizzard cards to keep the opposition at a distance, while drawing their win conditions. Wild players will get the most out of this weapon, since their win condition relies heavily on Ice Lance, though it'll help Standard players stall long enough to draw that precious Pyroblast. Secret Mage will especially get good use out of Aluneth, because their hands are almost empty in the later game. 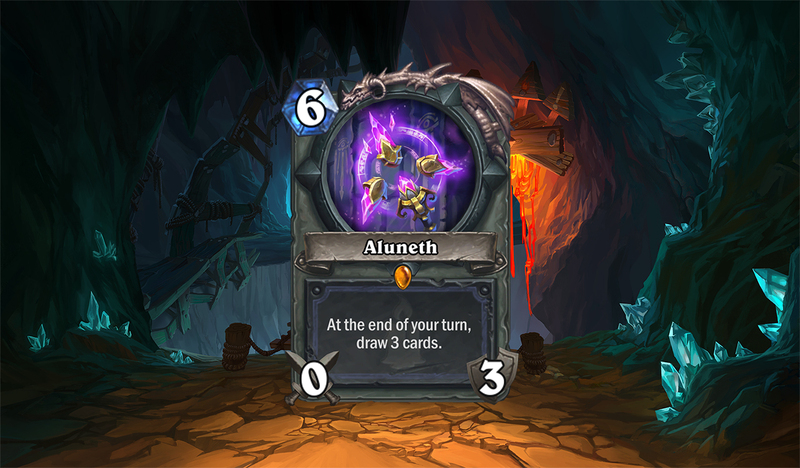 Aluneth not only keeps the Secret train rolling, but also helps players draw useful minions, like Kabal Crystal Runner and Ethereal Arcanist. 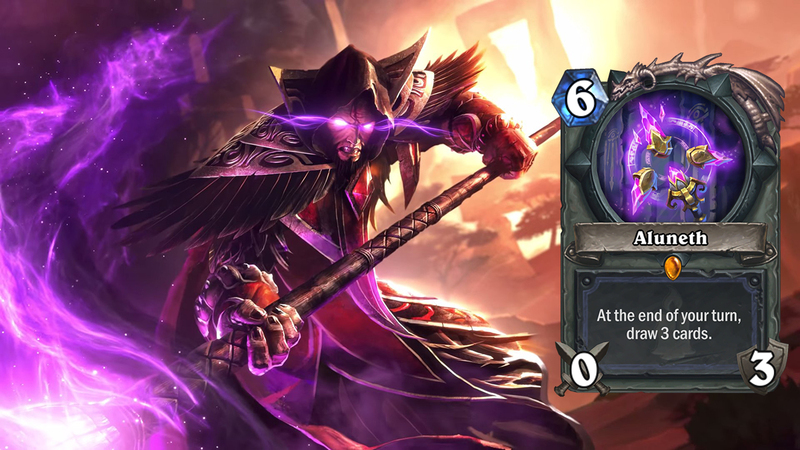 It capably fills a major hole in the Secret Mage's strategy and could make it a deck to be feared in the upcoming meta. The only concern with Aluneth is that it's a dead play at Turn 6, but if the Mage player can keep the game close, Frost Nova on Turn 9 should allow this weapon to be played relatively risk-free. There are still seven more weapons to break down and Shacknews will be here to analyze them over the coming weeks. Kobolds & Catacombs is set to hit Hearthstone in December.